Posted: Mon Sep 01, 2014 6:34 am Post subject: Icing Sugar Varoa Treatment. Icing Sugar: Icing sugar has been trialled for use as a varroa control. 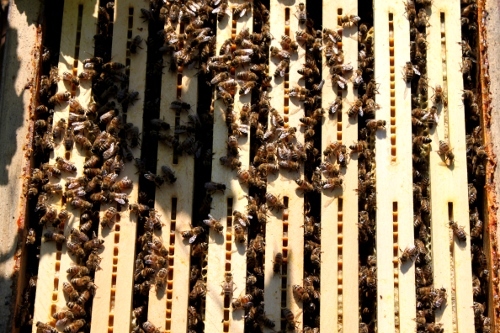 The sugar is dusted between the combs of hives at a rate of 15g per hive (2 storey). The treatment is repeated 4-6 times. 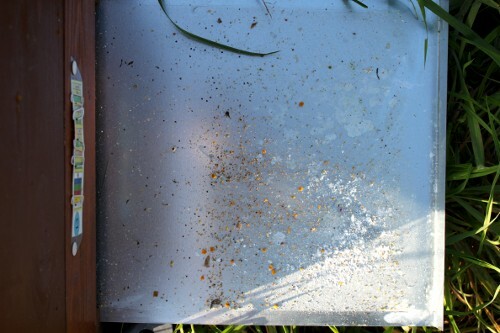 Icing sugar has proved to be an effective means of surveying bees for varroa mites37. Various powders, including glucose, wheat flower and stone dust have been trialled, either as a detection or control method123; 96; 124. 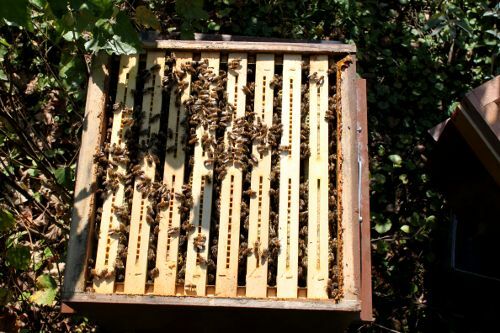 A field trial used 15g of sugar dusted between combs of hives during mid-summer, at varying combinations of days and times. The average mite fall on the treated colonies was between 47 and 56 times greater than the control colonies, although the exact efficiency could not be determined41. My understanding is that some studies show a much lower efficacy. However because methodologies are different it is difficult without having a degree in statistics to really be sure what the answers are. I will use it if I think a colony has a problem with varroa and also when uniting colonies to reduce/prevent fighting between the two. 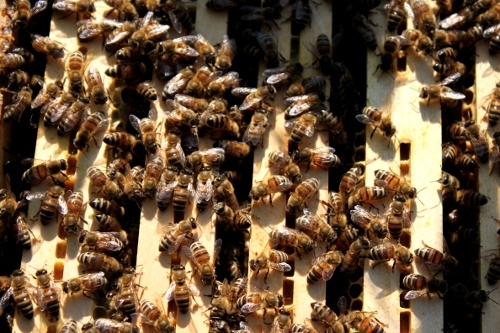 I know people who will always give a one off dusting to a new colony from a swarm before the queen gets around to laying which seems reasonable to me to give them a chance of a good start. Yes - I don't know yet what to make of icing-sugar use. I've got some in a container ready for use - perhaps I'm a bit short of a good method for applying it. But is it actually any use against Varroa - I just don't know. I applied MAQS (i.e. formic acid) strips in my two TBH some weeks ago. The 7 day treatment resulted in a very large (compared to before) mite drop - hard to say accurately, but maybe 100 times more, and no apparent harm to bees. If similar could be achieved using icing sugar, then maybe I should try, but then MAQS claims to get to the mites inside brood cells. I'm not really an 'organic' or 'natural' person, just 'practical' I think, so to me formic acid is no less 'natural' than sugar - you can hardly get simpler molecules; you can't say it doesn't occur naturally; and I think it's less likely to end up in 'honey' (at levels above what would be there anyway). I woudn't consider trying pyrethroid miticides (with associated likelihood of resistance), and thymol or oxalic acid treatments aren't considered suitable if there is honey which you might harvest in the hive, so don't take that as meaning I'll throw any chemical at them. Thanks for your reply CEEBEE, good to hear you didn't have any negative effects while using MAQS The following is a quote from a New Zealand Bee Forum by a respected member of the Forum. "To me the biggest risky part is doing that there may need to be a MAQS treatment done in November or December. MAQS can have a significant negative effect on a hive, right through to killing it completely. I have been reading just about everything written on Beesource about peoples experiences with MAQS over the last couple of years, and it appears to be exactly the same as my own experience using a FA fume board, which is to be expected because they are both FA. Most people report some kind of damage to the hive including dead bees and dead brood, plus disruption to the hive for the time the MAQS is in there. For me anyway, when fumigating FA, the first couple weeks after the treatment the bees do not do much they are lethargic, in a couple weeks they are fine in fact pumping, but there is a lost window of time that would be better to happen after the honey season when it doesn't matter, than during it." I use icing sugar to dust a cup of bees, so I can test them for varroa. This way I quickly check the varroa status of a hive instantly, without the need to count mites for a week. With some vigirous shaking the mites come off. No worries, the bees survive this procedure and get cleaned afterwards by the other nurse bees in the hive. As one can see, there are lots of differences between hives. Even in one apiary. The difference comes from heritage, since all the low mite hives come from a sturdy line of Buckfast bees, that cope very well with mites. I wouldn't use icing sugar in moisty, misty, wet weather, since the moisture turns the sugar into a sticky mess which really harms the bees, I'd say. I reckon icing sugar is unsufficient as a standalone treatment but a useful tool to check for mites. Randy Oliver and others are recommending alcohol shakes of a cup of bees to get accurate Varroa counts. This may be useful for commercial beekeepers but seems a rather drastic and fatal method for the bees sampled. Numerous demonstrations on YouTube. Not what I would do. The big down side is doing it in mid to late summer attracts the wasps. I did it in August, late summer here and the wasps went mad for it, and once they get attracted to the apiary they are very persistent. You have to catch all the sugar coming out of the hive and keep the area very clean. I understand you have some species of wasps that have managed to get over there one way or another...am I right? Some pictures from varroa-infested hives. About 10-15 % infestation. You find single cells, still capped, and if you open them you find multiple mites within them. 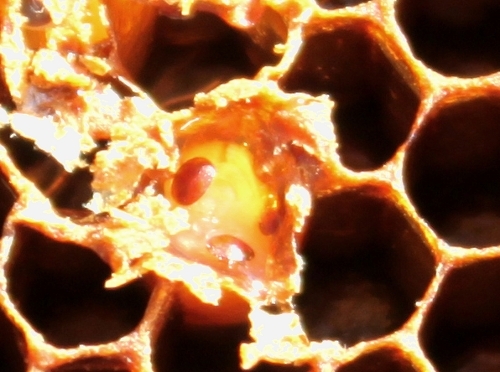 If the mites damage the young bee, it will not emerge and thus the varroa will die. Sometimes the devolopment time is just slowed down, which is in favour for the mites. The hive appears to normal from outside. No crawling bees, no deformation, nothing. 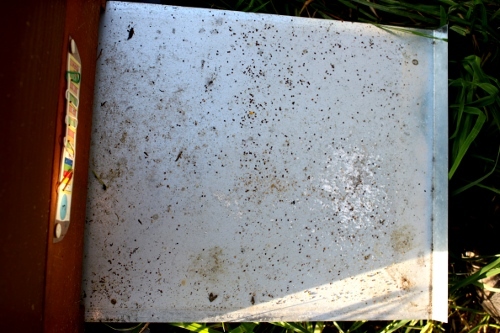 This is the varroa board after the treatment last week. This is a hive that showed little varroa when using icing sugar as a testing. 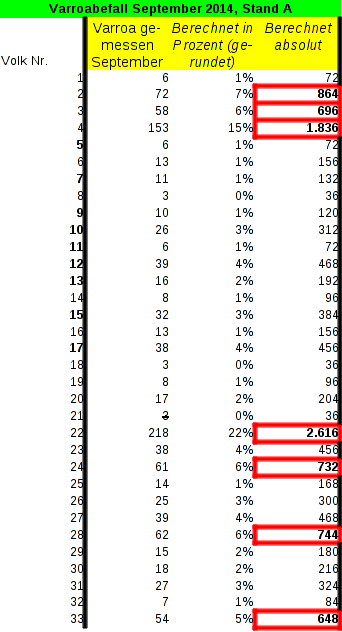 So the results are correlated with colony infestation level. This hive had the most varroas. See diagramm above. And this is how the varroa floor looks like afte some of the mites have been knocked down. If you don't treat such hives, they are done. This happens very quickly. Bernhard did you treat with icing sugar only or oxalic acid or another treatment? As I said above: for such an infestation level icing sugar is insufficient. Oxalic acid is what I used. 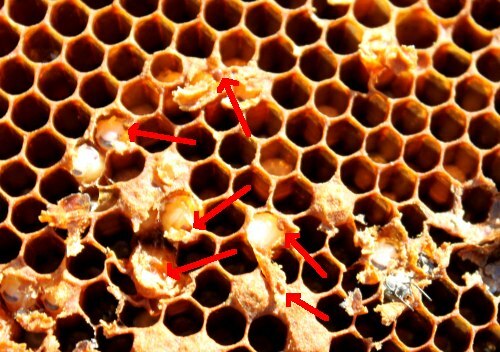 Do you see the oxalic acid affecting the bees and how do you apply? Direct to bees or vaporization ? Bernhard, I have watched your two videos on YouTube on sugar shakes. Looks easy with some preparation, I noticed you used a larger container on the first and a smaller plastic drinks cup on the second. How many bees per cup? Would a second shake release any residual mites? I also noticed red vs blue coloured bars in your graph, are these your differing bee types? How is the hive with greater then 2000 count doing? a larger container on the first and a smaller plastic drinks cup on the second. How many bees per cup? Right, I use the cup to measure the amount of bees to get comparable results. The bigger container is the shaker which has a mesh bottom. In literature it is said, that 100 ml = 50 g of bees = 500 bees. I am discussing this with a fried who doubts it. He says, it is just the half of the number. I will count the bees soon, to make sure. Would a second shake release any residual mites? Sure. I reckon about 10 % of the mites stick to the bees despite the shaking. It is not necessary to get each and every mite off the bes. It is sufficient to get an idea of the infestation level. In my experience everything above 10 % is critical, above 25 % is super-critical. I have seen colonies "surviving" more than 30 % but this is seldom and is plain surviving. Yes, a special buckfast bee that showed sort of resistance and passes this to the daughter queens. I have them since two years and are of the finest bees I have seen in my life. I make my own queens of that line and so far the bees show a good hardyness when it comes to varroa. It is no super bee, but a first step. How is the hive with greater then 2000 count doing? It is as strong as shown in the pictures in the other thread. So it got a lot of bees and brood. No deformed wings, no small bees can be seen. I think they make up the infestation by producing more bees. Outbrooding the mites. But this doesn't go forever, thus an emergency treating will save that colony. I won't use that hive to breed from, of course. So I will requeen it in Spring with a better strain. Thanks very much Bernhard, very informative as always, food for thought. You say you will re queen the hives showing lots of varroa. And you also say that those weak bees spread the virus via feeding the larvae with infected food thus spreading the virus to the new queen's brood. Isn't it better to simply let those weak colonies die and only keep breeding the ones who cope well with varroa? This is what I'm doing. No counting of varroa only observing DWV and letting the weak die. So far all my colonies survived treatment free but this year I start seeing a few hives with lots of DWV and I'm excited to see the colonies which survive the winter to start breeding only from my survivor colonies which can handle varroa without treatments. My problem is that my bees are from Sweden and now moved to Denmark, which has different local climate and forage and had mites much longer than Sweden. 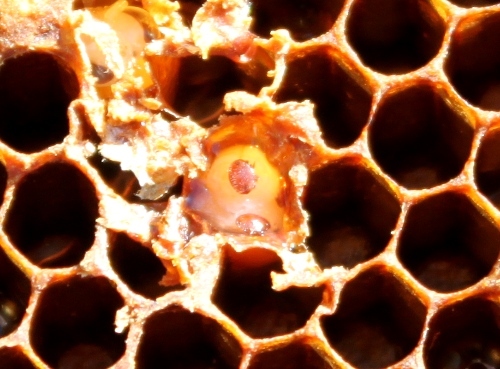 Denmark varroa might be more virulent due to being treated for so long. Time will tell. I will make sure to share my experience next spring. Yeah, the live and let die-method. Called Bond test. By letting them die, all the other hives receive the viruses and mites by robbing or by absconding bees that move into other hives. Colonies that do fine so far, break down because of this transfer. Sometimes it is just the sheer number of invading mites and viruses that leads to an overkill. This is why the Bond method produces 100 % losses regularily, every three to four years. This is unnecessary. Just mark that hive, so you don't use it for further breeding. 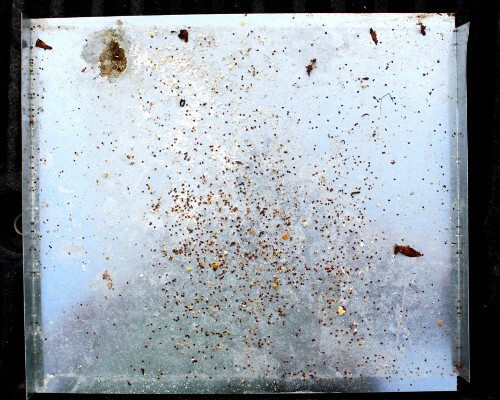 Remove varroa to stop the colony being robbed silently. Hives with varroa or a weak queen get robbed silently, you won't notice it at the entrance if you don't know how silent robbing looks like. I pretty much follow the Soft Bond method and recommend it because it is successful. After years I slowly see hardyness which is apparently inherited to the descendants. The best colony, though, can't stand a flood. That keeps losses at bay while progressing towards the right goals. Being completely treatment free. In Southern Italy there have been Small Hive Beetles found recently and it seems to spread quickly. A lot of beekeepers from all around Europe winter their bees there and also migrate there for pollination of citrus trees. Hopefully that pest stays out of our hives for a longer time, so we do not have another trouble to deal with. It is already tough to keep them alive. All hives were sulphured before the burning, but still a very sad thing.